Paradise Planned is a heavyweight tome – literally. With more than 1000 pages and measuring 310mm by 260mm by 80mm, it is the largest architectural history book I have ever tried to study. At 6kg, it is also the heaviest. The book is big and heavy for a reason. Its purpose is to establish the lineage of a particular approach to the design of towns – the garden suburb – stretching back 200 years, beginning in Britain and the USA and spreading across the globe. But this is not for historical or archaeological reasons but because, we are told, this way of designing towns holds the key to the future of our cities. Robert Stern is a practising New York architect whose interest in the garden suburb goes back 40 years; and his co-authors are not academics from Yale, where he heads the architecture school, but colleagues from Robert A M Stern Architects. This is history by and for practice. 19th century workers’ village, in Crespi d’Adda in Lombardy, based around cotton manufacturing. The argument is set out in the final chapter, ‘The Fall and Rise of the Garden Suburb’. It is the story of a ‘tragically interrupted tradition’, in which the long and glorious history of town building represented by the garden suburb was brought to a halt in the US in the 1940s by the automobile. Planners ‘caved in to the nation’s love affair with the car’ and, as sprawl became the norm, western nations abandoned ‘the glorious metropolitanism of the 19th and early 20th centuries’. But then in the 1960s and 1970s came a reaction and young architects ‘began to argue that Garden Suburbs were models for future planning’. One, namely Robert Stern, ‘called on architects to examine without prejudice’ the garden suburb and, in his (unrealised) 1976 Subway Suburb, showed how it could form a model for present-day cities. Other (realised) projects followed: Seaside and Celebration in the US, Poundbury in Dorset, etc. We are now at a crossroads: will we follow the model of the garden suburb, ‘the best template yet devised to achieve a habitable earthly paradise’, or will we allow our cities to collapse? This then is history with a purpose. The aim is not so much to understand as to mobilise, by describing and documenting hundreds of projects from around the world. In other circumstances these might be arranged alphabetically, geographically, or even digitally on an app; but here they are set out in a broadly chronological order. Aspects that are not germane to the mission are downplayed or omitted, most obviously the social goals that were central to so many of those who ‘settled’ in the garden suburbs, and the political objectives which led to these projects being funded or subsidised by the state. 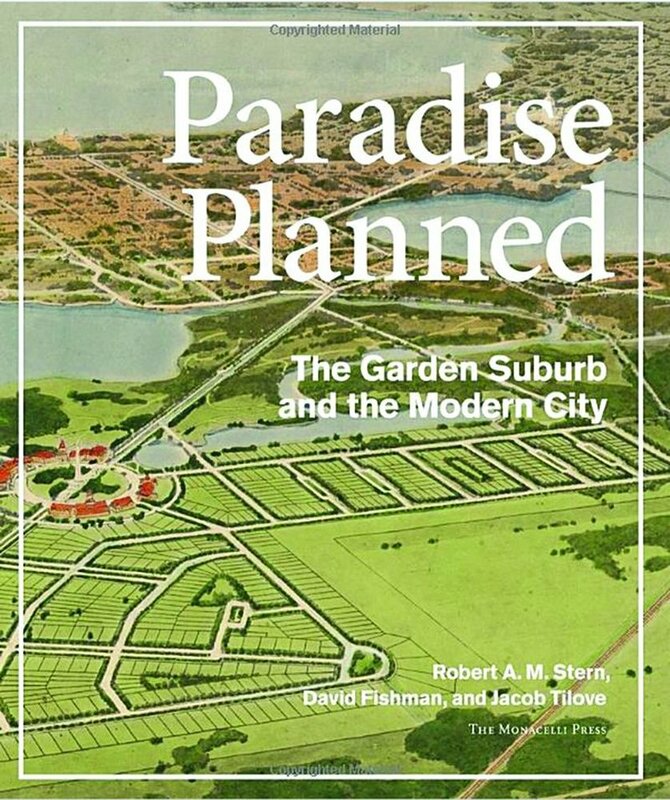 In this sense Paradise Planned is the history of garden suburbs sanitised for an American audience, an echo of what Henry-Russell Hitchcock and Philip Johnson had done in 1932 when they emptied European modernism of its social content and turned it into ‘the international style’. A ‘Bolshevistic’ undertaking? Yorkship Village, part of the American WW1 programme plan from the Emergency Fleet Corporation. Within these quite serious limitations, how successful is the book? The writing is clear and fluent, free from pretension and packed with relevant information; and each entry includes a good bibliographical note listing the main sources. So if you want to know about Finchley Garden Village in London or Crespi d’Adda in Lombardy or Jardin Europe in Sao Paolo, you will find a good thumbnail account here (more than a thumbnail for the most celebrated projects), often including quotes from the main authorities, as well as a list of sources for further information. Given that more than 1000 projects are covered, this is no mean feat. In addition, the visual documentation is exceptional. Most projects get at least four images (and some many more), the majority in colour, typically including the layout plan and/or aerial photo and a number of street views. Sarah Acheson is credited as picture researcher and she did an amazing job. A home between the city and the countryside: Stern’s unbuilt 1976 Subway Suburb. It is not surprising that the most successful parts of the book are those dealing with the USA. In particular there is an excellent section on the emergency housing that was conceived and built during the World War One to meet the armaments needs of the US government. This involved the Emergency Fleet Corporation and the US Housing Corporation building more than 70 garden suburbs, mainly in shipbuilding and armaments towns strung along the east coast. In architectural ambition as well as scale these eclipsed what was done in the comparable programme in Britain. The authors do them proud, supplementing the characteristically detailed and informative project descriptions with, uncharacteristically, a good overview establishing the context and explaining how, the moment the war ended, Congress demanded an end to these ‘Bolshevistic’ undertakings. If there had been more historical explanation of this sort elsewhere in the book, its claims to be the ‘comprehensive monographic treatment’ of the subject would have been a lot more convincing. Mark Swenarton is James Stirling Professor of Architecture at Liverpool University.